Yes, Prince and Josh have touted in every article how 3rdEyeGirl drummer Hannah’s husband is Prince’s producer of choice and how much of a hand he had in this release. The issue is, it’s such a heavy hand it leaves Prince sounding like a guest on an album bearing his name. 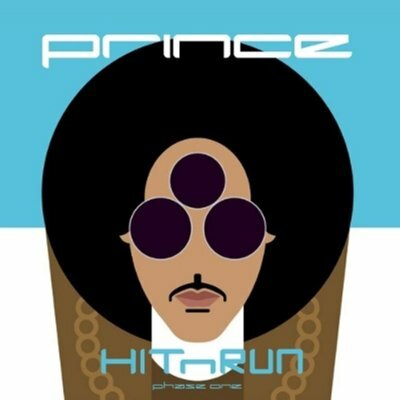 And my joke about this being a mixtape aside, let’s call HITNRUN Phase One for what it is. A lazy, uninspired collection of remixes, songs that have been sitting around for awhile or already released online and some of the most embarrassing material Prince has ever put out. Now before the Purple Apologists rush to label me a hater, look no further than my review of last year’s excellent Art Official Age. Joshua Welton also played a big part in that album’s production. The difference is, AOA still sounds like a Prince album. It retained enough of Prince’s signature sounds to come across as an updated version of the legend, but still true to the essence of Prince’s musical history. I know there was a lot of hand wringing from some of the fan base over Welton’s involvement, but other than the ill placed remix of “FUNKNROLL” that would have fit this new album much better than sticking out like a sore thumb on Art Official Age, Josh and Prince got it right. But with HITNRUN Phase One, Welton has worn out his welcome with a grab bag of tired, generic electronic tricks and outdated beats and effects that only the truly out of touch can think will earn Prince club play. No self respecting club or DJ is going anywhere near any of the material on this album, from the repetitive clapping beats to the chopped and slowed down vocal effect Welton is obviously in love with since it’s used on at least half the songs here. What Welton has amazingly done is eliminated almost any semblance of what makes Prince great from this album with an over-produced mess. Things start off pleasantly enough with “MILLION $ SHOW” featuring the fantastic Judith Hill on vocals. Prince used a version of this track to open his recent HITNRUN Tour shows so it makes sense it opens the album and as an intro it does the job. What it doesn’t prepare you for are the next three tracks, a run of awfulness I never thought would take place on a Prince album. In fact, I dare you to find a sequence in Prince’s long, storied career of three songs in a row on an album worse than the trio of dreck that is “SHUT THIS DOWN”, “AIN’T ABOUT TO STOP” featuring Rita Ora and “LIKE A MACK” featuring something called Curly Fryz. This stuff makes “Jughead” sound like a masterpiece. Truly, utterly embarrassing and the signs of a 57 year old man trying too hard to appeal to what he thinks the kids are listening to these days. Again, I dare you to find a worse sequence on a Prince album. You can’t. After a completely unnecessary and inferior remix of the Art Official Age track “This Could B Us”, things get slightly better in the album’s second half. “X’S FACE” is about the closest Welton comes to pulling off what he is attempting here with these club sounds and I liked “HARDROCKLOVER” from the get go, it’s by far the best track on HITNRUN Phase One, in no small part thanks to Prince’s guitar work. Then we have a pointless, brief instrumental remix of “Clouds” titled “MR. NELSON” before the album closes on a slight uptick with an update of the long vaulted track “A 1,000 Hugs And Kisses”, now titled “1000 X’S & O’S” and “JUNE” which at least has a semi-interesting lyric. Sadly, neither of these final two tracks really go anywhere musically but even the generic production can’t ruin “1000 X’S & O’S” completely. Originally recorded with both Rosie Gaines and later Nona Gaye, it’s nice to see the song released after all these years in some form. When you’ve been around as long as Prince has, you’re bound to make some mistakes. In a career that includes an ill-advised rock opera adaptation of Homer’s Odyssey (Glam Slam Ulysses), a musically sound but lyrically mind-boggling album about Jehovah’s Witnesses (The Rainbow Children), a film so bad it sunk his once promising movie career with a giant thud (Graffiti Bridge), and infamously changing his name to an unpronounceable symbol, this is the worst thing Prince has ever done.